Customer needs in terms of temperature management vary from one customer to another. So, we have an obligation to adapt to this requirement. Consequently, in their original version, our radiators do not incorporate a temperature management system. Advantage n°1 | Our radiators are only 2 cm thick. It is the design radiator above all, which also makes you gain in living area. Advantage n°2 | Do you already have a control system? We are compatible with any standard control system (without pilot wire) from any manufacturer. Our radiators work on “all-or-nothing” basis. Whether you have a home automation box or a simple wired thermostat, our radiators will be “compatible” with your existing solution. Your needs evolve? Do you want to install an internet control in a few years? Our radiators will remain compatible (unlike conventional radiators). Advantage n°3 | Our breakdown rate is below 0.5%. Indeed, the fact of not placing electronic elements in our radiators eliminates 90% of the risks of failure, mainly related to the fact that the electronics are in contact with the heat emitter. 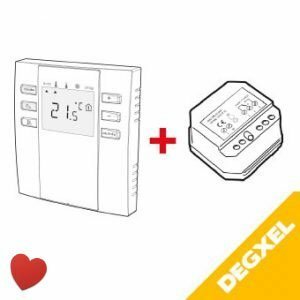 Learn more about the DEGXEL heaters. Advantage n°4 | Opting for a “remote” thermostat means optimizing temperature measurement and comfort. From a thermal point of view, measuring the temperature in the direct vicinity of the heating element does not make much sense. Therefore, our wired or radio thermostats can be placed at the most significant measurement point in the area (and therefore not on the radiator). Basically DEGXEL radiators come with a long power supply cable which size will always be sufficient whatever your project is. The cable ends in an extra-flat plug for easy connection. 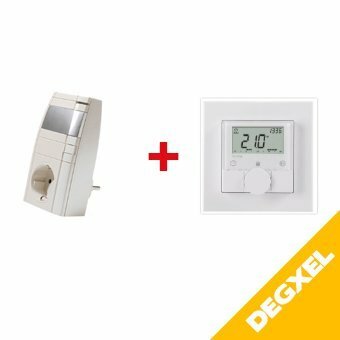 Learn more about the electrical connection of DEGXEL heaters. Even if the radiator can function in this way, for reasons of energy efficiency, we strongly recommend that you install a thermostat system, whether it is wired or wireless, standard or via the internet. The following optional equipment has been rigorously selected by our French team. This equipment has been tested and checked in real conditions for years. However, you can also decide to acquire the desired temperature management system from a supplier of your choice. Connect the radiator plug to the front of the radio socket. Place the thermostat where you want it in the room (battery operated). Set the thermostat to the desired temperature. It transmits the on and off commands to the radio socket which starts and stops the radiator. Advantage: Plug and Play. Disadvantage: the wire is partly visible. German manufacture. 2-year warranty. 1 Wireless Switch Receiver (dimensions Length = 51 mm x Width = 48 mm x Height = 28 mm) to be placed in the electrical socket (from which the facade has been removed) and to be connected to the radiator and the power supply. 1 receiver per radiator. 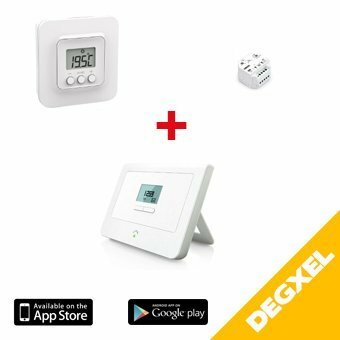 1 Wireless Thermostat (battery operated) to be placed where you want it (within the same room). Learn more about the ideal location for a room thermostat for radiators. 1 Thermostat can control as many radiators as desired in the same area (1 zone = 1 room in general). 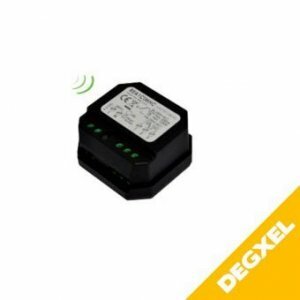 Set up the initial wireless communication between the receiver and the thermostat in 2 clicks. Set the desired comfort temperature. The thermostat sends the order to the receiver to turn on the radiator. When the temperature is reached, the thermostat sends the order to the receiver to turn off the radiator. Eco: the room thermostat will operate 24 hours a day to achieve the temperature which has been set (by default 18°C). Adjustable from Comfort-1 to Comfort -5. Select this mode for short-term absences. Radio transmission range: 15 to 20 meters. Signal emitted every 10 minutes only (reduce electromagnetic emission). 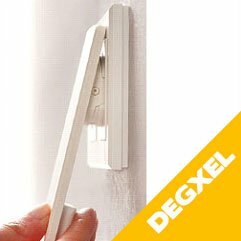 This kit is fully adapted to control DEGXEL’s radiators. It fully contributes to a complete solution of energy savings and optimized comfort. However, you can select any control system (wired, wireless, local, remote, etc.) of your choice as our heaters can be controlled by any room controllers. 1 Wireless Switch Receiver (dimensions Length=53 mm x Width=46 mm x Height=30 mm) to be placed in the electrical socket (from which the facade has been removed) and to be connected to the radiator and the power supply. 1 receiver per radiator. 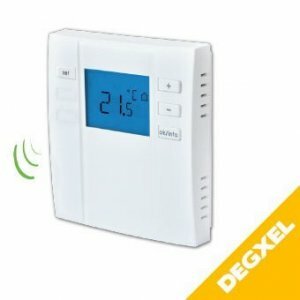 1 Wireless Programmable Room Thermostat (battery operated) to be placed where you want it in the room. Learn more about the ideal location for a room thermostat for radiators. 1 Thermostat can control as many radiators as desired in the same area (1 area = 1 room in general). 1 Smarthome Central Automation Unit (Smarthome hub for the whole house). It receives the orders transmitted by the smartphone application and collects the temperature of the room thermostats. It retransmits the ON and OFF commands to the receiver of each radiator. If you wish to control other heaters, add 1 receiver per heater to be controlled and 1 thermostat per new room. Made in France. 2-year warranty. Thermal comfort (the temperature is measured in the living area and not on the heat emitter). The installation is very simple and fast to accomplish. The control of the thermostat is immediate. Plug the home automation hub into your hub (BT, Sky, Virgin Media, TalkTalk, …) with the supplied cable. Install the home automation application on your smartphone and/or tablet (for IOS or Android). Connect the wireless receiver to the heater and power supply. Launch detection via the software. Confirm the detection of the thermostat and receiver. Control your radiator as you wish: ON/OFF, on time slots, etc.